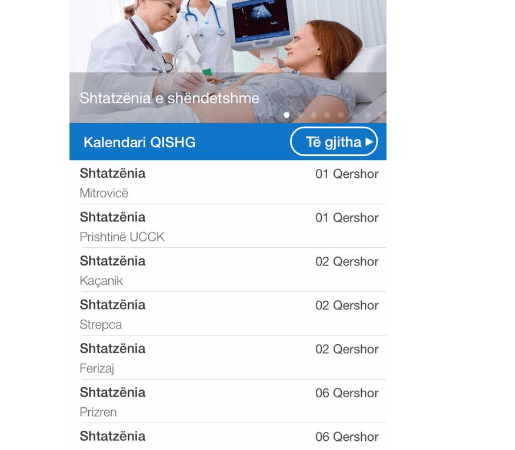 Stemming from the pressing need to access essential information on pregnancy, family planning, labor, and child care in a fast and easy fashion, Action for Mothers and Children has initiated the development of the first mobile application in Albanian language, which provides evidence-based information on the aforementioned topics. The mobile application “Nana” represents an extension of AMC’s program Women’s Health Resource Centers – “Mothers’ Classes” and the online website www.beba-ks.com. Its development was powered by the joint support of IPKO Foundation, the Australian Embassy through its Vienna Office in Kosovo, and the predominantly in-kind contribution of the developer company “Zombie Soup”. The network of Mothers’ Classes established by AMC and ran at the family medicine centers level in 6 cities in Kosova mobilized women of all ethnicities, backgrounds, social and economic status with one common goal – improve the survival rate and health of their own and their children. Counseling on pregnancy and child care topics is provided in a warm and colorful environment with video demonstrations, physical exercises, and male partners’ involvement. Witnessing the eagerness for novelty and access to evidence-based information, AMC undertook the initiative of developing the mobile application “Nana”, which includes a multitude of engaging and interactive modules and features. As a first step towards developing the application, we merged informative sections that should reach our target audience from the website and Mothers’ Classes curricula. Transmitting our concept and outreach goal to the developers’ team followed next, involving a multitude of meetings while developing the beta version of the application. – Ovulations Calendar: Provides a user friendly setting for entering and monitoring the ovulation period for women. – Due Date: Used to calculate the development of pregnancy and to determine birth giving date. This feature enables women to have information about their pregnancy and development of their child, as well as have the psycho-physical preparation for the labor process. – Contractions Calculator: Essential for preparing future mothers for managing the first phase of giving birth, or contractions, and get prepared for the second phase of labor, which is expulsion (or the “pushing stage”). – Schedule of Activities in WHRCs: This section contains the schedule of counseling sessions and activities in Mothers’ Classes and enables women to plan for attending sessions based on their topic of interest. – Tools and Resources: This is an informative section and provides simple guidelines on topics like: healthy pregnancy, nutrition, development of the baby during each stage of pregnancy, breathing techniques, breastfeeding, immunizations and also a section for exercises during pregnancy. Our AMC team is super excited to launch this application so essential for current and prospective parents, women, and also children, serving a vital purpose for healthier mothers and children. Our goal remains to enrich the application through users’ feedback and insights in order to ensure higher engagement and benefits for all users.